Ferghana Valley is a unique place of Central Asia where one can see sands, mountains and fields. The valley is surrounded by the Tian Shan range to the north and Alley to the south. Shakhrisabz is a unique town-building and architectural monument of Central Asia. It holds a special place among other historical cities of Central Asia. Nurata is the administrative, economic and cultural center of most mountainous region in Navoi province. Nurata town lies at the foot of the Nurata Mountains, occupying 170 km, from Djizak town in the east to Navoi town in the west on the border with the Kizilkum desert. 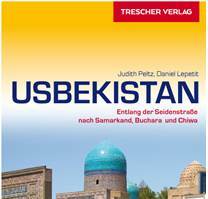 Nukus, the largest city and the capital of the Republic of Karakalpakstan, is located near the Aral sea. From the South and East the city is surrounded by the Kyzylkum desert. Archaeological excavations on the Ustyurt plateau discovered the remains of caravanserais and wells, lying on the Great Silk road. But the cultural layer of Nukus is much deeper – people began to settle here from the IV century B.C. Termez is the cradle of Buddhism in Central Asia. Present Termez, which is the regional center of Surkhandarya province, was founded around Russian garrison fortress in the 19th century.